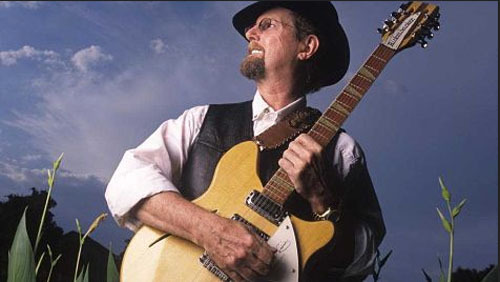 Folk-rock legend Roger McGuinn’s “Your Love Is a Gold Mine” is tailor made for our “Music Friday” edition, where featured songs must include jewelry, gemstones or precious metals in the title or lyrics. This song contains a bonanza of qualifying references, including eight types of gemstones and three precious metals. In the opening lines, the former lead singer and founding member of The Byrds sets the scene of his 1991 love song with an assist from rubies, sapphires, emeralds and diamonds. In the second stanza, he follows with jasper, chrysolite and topaz. Later in the song, he references amethyst and then turns to the precious metals platinum, sterling silver and yellow gold. McGuinn doesn’t stop there. His allusions include jewelry terminology, such as “facets” and “refined.” We thinks it’s fair to say that “Your Love Is a Gold Mine” is the musical gold standard for our Friday feature. Back in 1965, The Byrds — which included David Crosby, Gene and Michael Clark and Chris Hillman — burst onto the music scene as America’s answer to The Beatles. 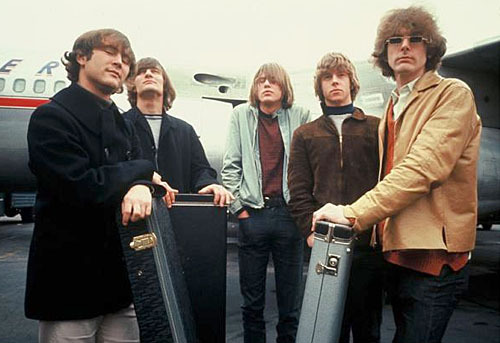 Led by McGuinn on his famous 12-string electric guitar, The Byrds zoomed to the top of the charts with a rapid-fire succession of rock and roll’s most enduring songs, such as "Mr. Tambourine Man," "Turn! Turn! Turn!,” "Eight Miles High" and "So You Want To Be a Rock 'n' Roll Star." The Byrds disbanded in 1973, but McGuinn went on to have a successful solo career that continues today. The 71-year-old rocker, who is a member of the Rock and Roll Hall of Fame, has performed with the likes of Bob Dylan, Tom Petty and Elvis Costello. We invite you to enjoy McGuinn’s gem-rich “Your Love Is a Gold Mine” at the end of this post. The lyrics are below if you’d like to sing along. Written by Roger McGuinn and Dave Stewart. Performed by Roger McGuinn. Citrine is one of the official birthstones of November, and the sunny yellow stone you’re looking at is the world’s largest faceted citrine — an oval-cut marvel at 20,200 carats (that’s 8.8 pounds!). Named for its host city, the “Malaga” was added in June of 2010 to the “Special Exhibition Gems” section of Art Natura in Spain, a natural science museum featuring one of the world’s most extensive collections of colored gemstones. “Malaga,” which measures 20 x 15 x 10 centimeters (7.87 x 5.90 x 3.93 inches), is considered nearly flawless and has a permanent place in the exhibit alongside other extraordinary gems, such as the 31,000-carat imperial topaz, “Eldorado.” Topaz happens to be the other November birthstone. 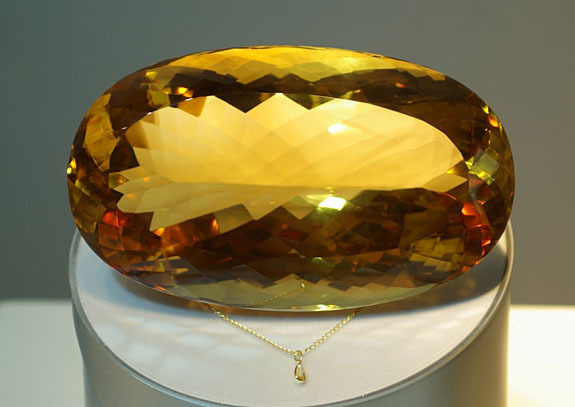 The previous record holder for the largest faceted citrine is also in the Art Natura collection. It’s the “Sol del Sur” (Southern Sun), an extraordinary 8,200-carat, oval-cut stone. 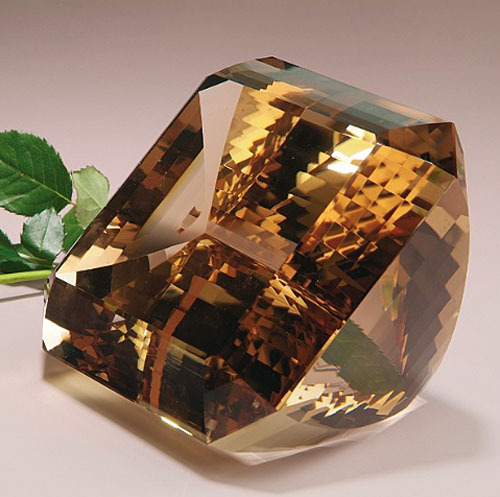 Another sizable citrine in the collection is “Soledade” (Solitude), an emerald-cut stone weighing 6,705 carats. Besides its exceptional color, transparency and purity, what makes the “Malaga” so extraordinary is its enormous size. Rarely does nature present a citrine crystal that could yield such a large faceted stone. Typically, citrine crystals are found in geodes and measure just a few centimeters in size. When they are found in larger formations, the quality is usually lacking and these specimens are used as decorative items. 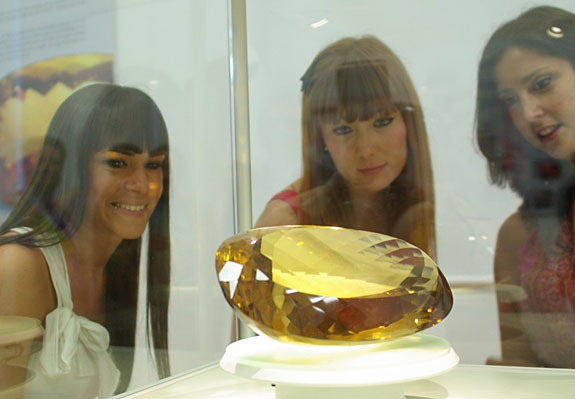 The mammoth rough citrine crystal that would become the “Malaga” was unearthed in Mina Gerais, Brazil, in 1990. Due to the risks, complexity and special equipment required to cut and polish the stone, it remained in its original form for 19 years. Finally, in 2009, a team of Brazilian gem cutters took on the formidable challenge of shaping the stone — with startling beautiful results. Art Natura boasts one of the world’s largest collections of noteworthy gemstones. 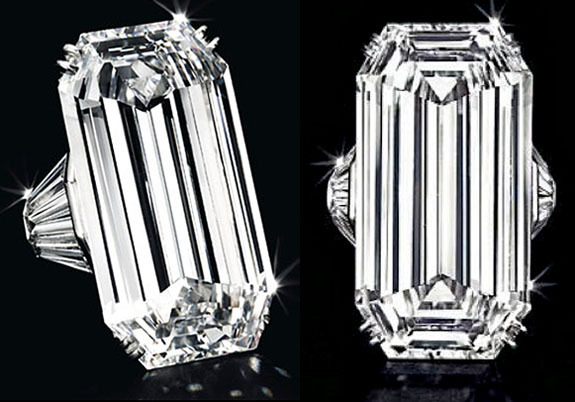 In all, the collection comprises more than 500,000 carats. The “Special Exhibition Gems” section, which now includes the “Malaga,” features 24 gemstones that are world-class in terms of size, purity and color. A member of the quartz family of gemstones, the sun-kissed citrine is a near-cousin to February’s purple birthstone, the amethyst. Citrine takes its name from citron, the French word for lemon, and can range in color from the warm hues of golden champagne to the deep oranges of Madeira wine. The stone perfectly represents the fall season. Most citrine comes from Brazil, but other important sources include Madagascar, Bolivia and the United States. Citrine wasn’t always an official birthstone for November. The National Association of Jewelers added it in 1952 as an alternative to topaz. 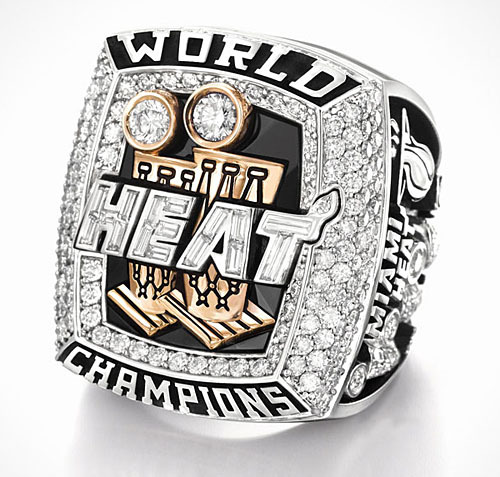 Weighing nearly five ounces and sparkling with 260 diamonds and three black onyx stones, the Miami Heat’s 2013 championship rings are a dazzling tribute to a franchise-best 66-17 season that included a 27-game winning streak. 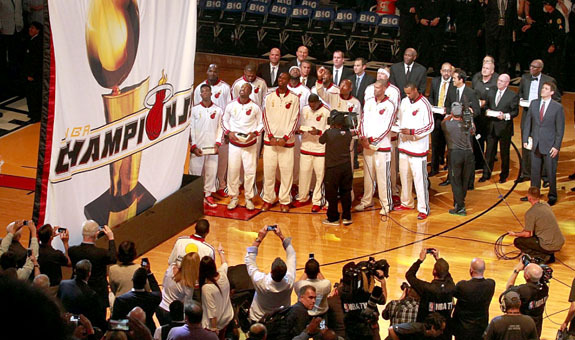 The 2013 championship is the Heat’s second in a row and its third in the past eight seasons. Back-to-back championship team members — including LeBron James, Dwyane Wade and Chris Bosh — received their rings last week during an on-court ceremony just before the team’s home opener against the Chicago Bulls. Commenting on the rings, Wade said, "I think they get better every year." The nine-time all-star guard also believes the mammoth proportions of the ring are a matter of design necessity. "It's always good to add another trophy [symbol] to the rings. For our franchise, this is our third one, so to add another trophy onto those rings they had to be a little bigger." The 2013 ring, which was created by Jostens, weighs a total of 135 grams and includes 242 round-cut diamonds, 16 custom baguette-cut diamonds and three black onyx stones. The total weight of the gems is 10.3 carats. The face of the ring features two 14-karat gold Larry O’Brien NBA Championship Trophies set atop a brilliant black onyx stone and surrounded by 187 sparkling round diamonds. The two basketballs in the trophies are actually round diamonds. Sixteen custom-cut baguette diamonds are used to spell out the team’s name across the center of the ring’s face. Framing the top and bottom of the symbols are the words "WORLD" and "CHAMPIONS." The left side of the ring features the recipient’s last name in raised white gold against a black background, the year 2013 and the team’s internal symbol — a black trophy. Encircling the trophy are the words "BACK TO BACK" to recognize the team’s second straight NBA title. A faceted black onyx represents the ball above the trophy. Etched on the base of the black trophy is the team’s motto, "sacrifice," written in Chinese — a tribute to where the journey to the 2013 title began. The team had played its first two exhibition games of the 2012-2013 season in Shanghai. The right side of the ring features three NBA championship trophies set with 53 round diamonds, representing the franchise’s 2006, 2012 and 2013 championships. The word "FAMILY" is inscribed below the trophies and embodies the belief that all ring recipients are part of the Miami Heat family. To the right of the trophies are the Miami Heat’s flaming basketball logo and the NBA logo. Engraved inside of each player’s ring are the phrases "Franchise Best 66-17 Record" and "27 Game Winning Streak." These phrases memorialize the team’s 2013 season record and historic 27-game winning streak, the second longest in NBA history. After keeping her marriage under wraps since June, Avatar actress Zoe Saldana surprised the paparazzi and her fans this past weekend when she finally revealed her stunning pear-shape emerald-and-diamond engagement ring during the LACMA Art + Film Gala in Los Angeles. 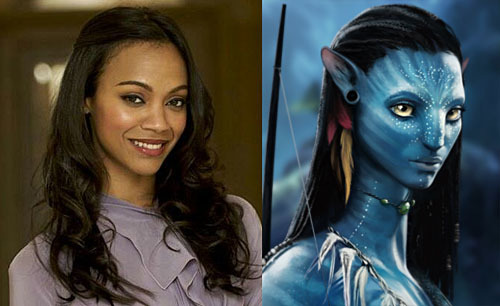 The 35-year-old actress, who earned critical acclaim for her “virtual” performance as Neytiri in James Cameron's 2009 blockbuster, Avatar, tied the knot with 34-year-old Italian artist Marco Perego during an intimate — and secret — ceremony in front of close friends and family. The emerald in Saldana’s ring weighs approximately 6 to 8 carats and is valued between $18,000 and $32,000, depending on the clarity and origin of the stone, according to Zaven Ghanimian, marketing director for Simon G. Jewelry. He told E! News that trillion diamonds about .75 carats to 1 carat in size flank the center stone in a custom ring that features a popular halo setting and micro-pavé diamonds along the band. Saldana joins actress Halle Berry and former First Lady Jackie Kennedy on the short list of luminaries who have worn emerald engagement rings. Berry’s four-carat emerald, which is said to be of “perfect” color, was sourced from the now-closed-down mines of Muzo, Colombia. Berry’s emerald is set in a hand-forged 18-karat yellow gold band. 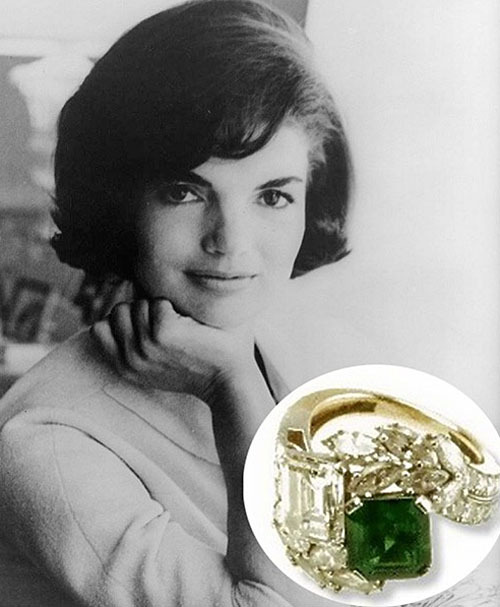 Kennedy’s famous engagement ring featured a 2.88-carat diamond mounted alongside a 2.84-carat emerald. During John F. Kennedy’s presidency, the ring was redesigned with more than 2 carats of round and marquise accent diamonds. 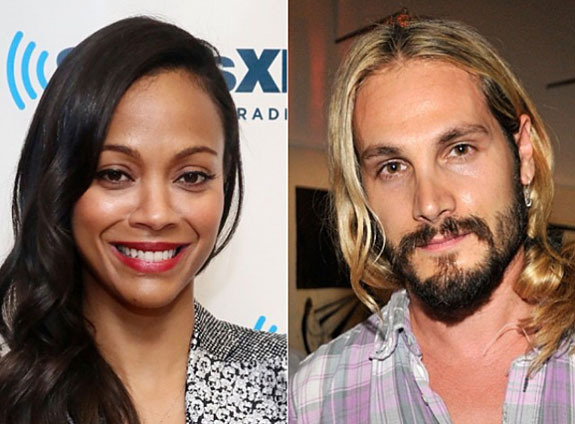 Previously, Saldana had dated the CEO of My Fashion Database Keith Britton for 11 years before breaking up in 2011. She was also in an “on again, off again” relationship with actor Bradley Cooper from 2011 until January of this year. Londoners Ed Grant and his pug-obsessed girlfriend, Alexandra Justins, were in New York City recently enjoying what was supposed to be a simple four-day getaway. What Justins didn’t realize was that her romantic boyfriend had much bigger plans in store. 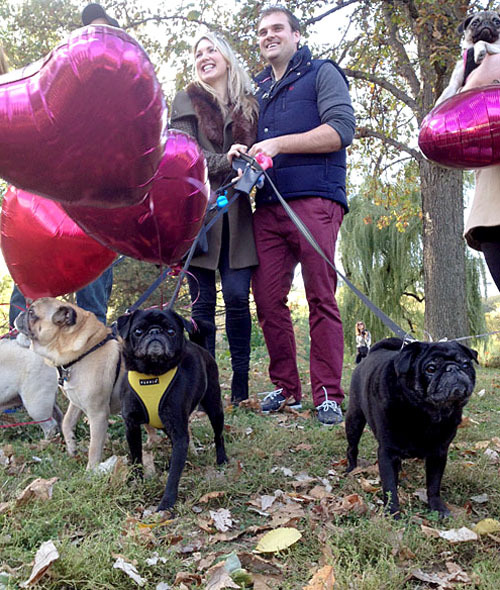 On a crisp Sunday afternoon in Central Park, the couple had meandered to the highest point of the picturesque Bow Bridge when they were greeted by a sniffling pack of 16 adorable pugs, each one tethered to a giant red heart-shaped Mylar balloon. Justins wondered out loud what the balloons were for, but before she got an answer, Grant dropped to one knee. Amidst the clamor of the 16 pooches and the fast-growing crowd of curious onlookers, he asked Justins to be his wife. The ecstatic bride-to-be said, “Yes,” and the crowd cheered. The exciting pug encounter was no happenstance. 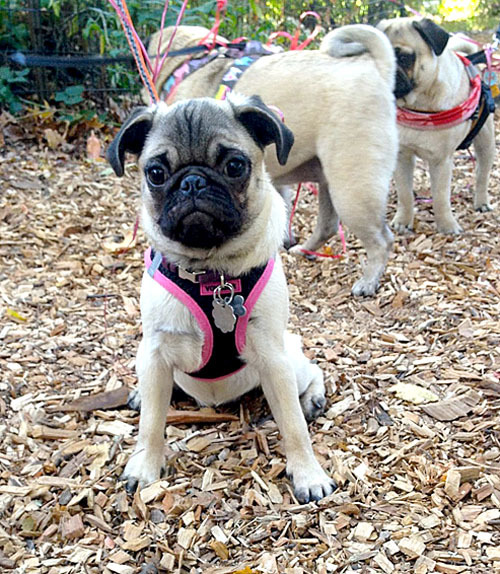 Grant had contacted a local pug meet-up group, whose New York and New Jersey members were pleased to bring their dogs to Central Park to participate in the memorable event. Justins absolutely adores pugs, and although she doesn’t have one of her own, they light up her world, according to an account in the Bark Post. “I have never seen Alex happier than when she sees a pug, so I thought I would make her super happy [by seeing 16 at once], and then I hoped even happier by proposing to her!” Grant told TODAY.com. 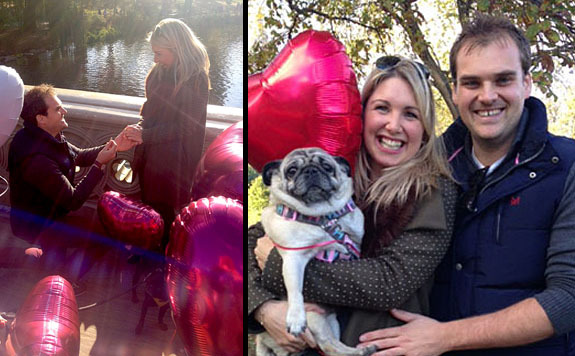 Justins was touched by the kindness of the pug owners — strangers who were willing to go out of their way to make her day special. “I was totally overwhelmed and I could not believe that Ed had organized everything,” Justins told TODAY.com. “It made an incredibly special moment even more memorable. Although the couple’s apartment doesn’t allow for a pug companion, as soon as they move to a larger place there will be a wrinkly new addition to the family. 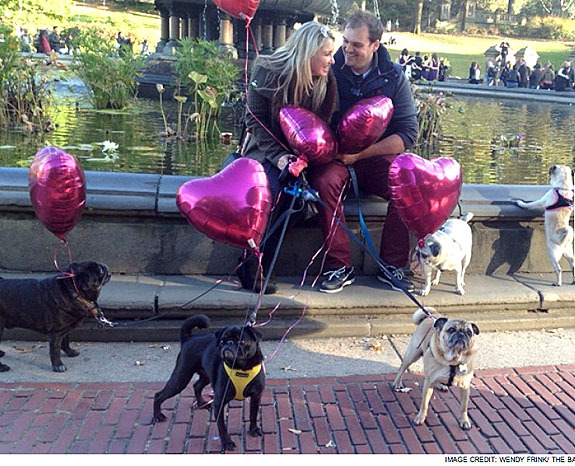 The pug will be named “Bow” in honor of the Bow Bridge and their very special Central Park engagement. Let’s take a musical voyage back to the summer of 1970, when The Jackson Five were burning up the Billboard Hot 100 charts with four consecutive #1 hits. Each of the songs has stood the test of time, but “The Love You Save” qualifies for our Music Friday feature because it includes an important reference to a promise ring. In the song, a 12-year-old Michael Jackson is maddened by a girlfriend who can’t seem to shake her cheating ways. When they were little kids, she was always chasing after the boys. 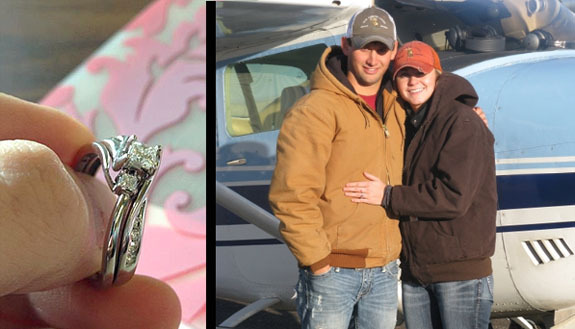 Now that she’s older, a promise ring from Michael is not enough to keep her faithful. Music historians believe that the emphatic “stop” at the beginning of “The Love You Save” is a nod to The Supremes’ “Stop! In the Name of Love,” which was released on the Motown label in 1965. Diana Ross, the lead singer of The Supremes, is often credited with having discovered The Jackson Five (also on Motown). “The Love You Save” was the third of four rapidly released chart-toppers by The Jackson Five in 1970. The others included “I Want You Back,” “ABC” and “I’ll Be There.” These songs are often mashed and merged in still-popular Jackson Five medleys. The founding members of the Jackson Five included brothers Jackie, Tito, Jermaine, Marlon and Michael. During a successful run from 1964 to 1990, The Jackson Five (later to be called The Jacksons) amassed international legions of screaming fans and sold more than 100 million records, making them one of the most successful groups of all time. We hope you enjoy the neat clips at the end of this post. The first video, captured from the Diana! 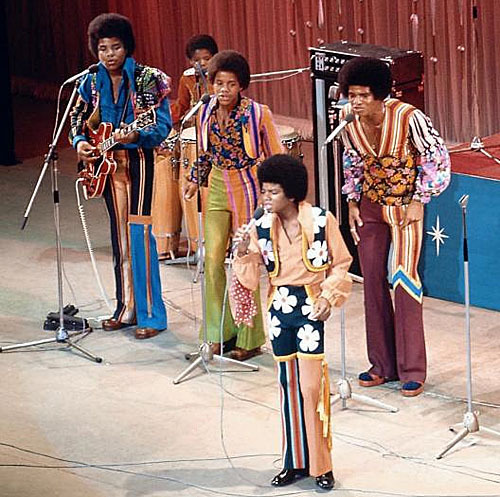 Special in 1971, features a 13-year-old Michael Jackson and his brothers singing “The Love You Save.” We've also added a bonus clip of a grown-up Michael and his brothers performing the same tune 12 years later at Motown's 25th Anniversary gala. The lyrics are below if you’d like to sing along. Written by Deke Richards, Freddie Perren, Alphonso Mizell and Berry Gordy Jr. Performed by The Jackson Five. They'll turn your name to dirt, oh. 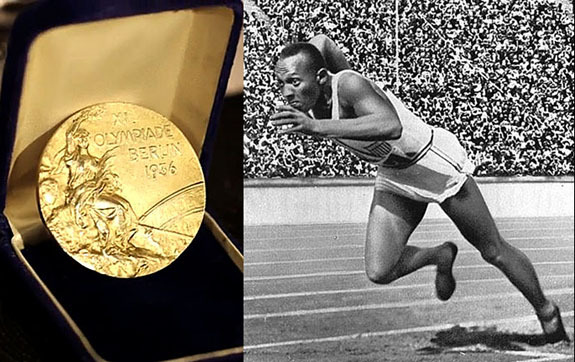 Hold on, hold on, hold on, hold on..
One of four gold medals won by American Jesse Owens during the 1936 Olympic Games in Adolf Hitler’s Nazi Germany is expected to fetch $1 million or more when it hits the auction block later this month. 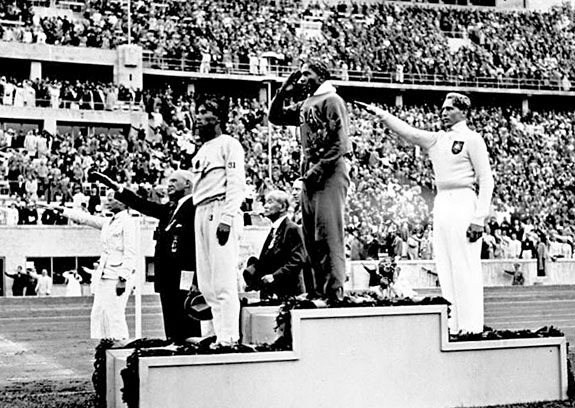 Owens’ performance in Berlin was one of the most significant in Olympic history because Hitler was convinced the Games would showcase what he believed was the superiority of the Aryan race. Instead, the 23-year-old black American embarrassed the German dictator by dominating his athletes with decisive wins in the 100- and 200-meter dash, the long jump and as a member of the 4x100 meter relay team. Due to the historical significance of the medal, and because the whereabouts of Owens’ other three are unknown, this one could fetch more than $1 million, according to SCP Auctions’ president David Kohler. "We think this is a seven-figure piece," Kohler told ESPN.com. "We expect to see a good deal of international interest and could see some institutions bidding. This is so much bigger than a piece of sports memorabilia. It's a piece of history." The online auction house, which specializes in sports rarities, will be accepting bids from November 20 through December 7. The 55mm medal features Giuseppe Cassioli's famous "Trionfo" design, which was showcased on the Summer Olympic medals from 1928 through 1968. The obverse depicts Nike, the Greek Winged Goddess of Victory, holding a palm in her left hand and a winner’s crown in her right, with the Colosseum in the background. The reverse shows a jubilant crowd carrying a triumphant athlete. Owens, who passed away in 1980, had given the gold medal to his good friend, entertainer Bill “Bojangles” Robinson. The medal came to the auction house via the estate of Robinson’s wife, Elaine Plaines-Robinson. Owens’ medal could break the record for the highest price ever paid at auction for Olympic memorabilia. In April 2013, $865,000 was the winning bid for the silver cup earned by the 1896 Olympic marathon champ. 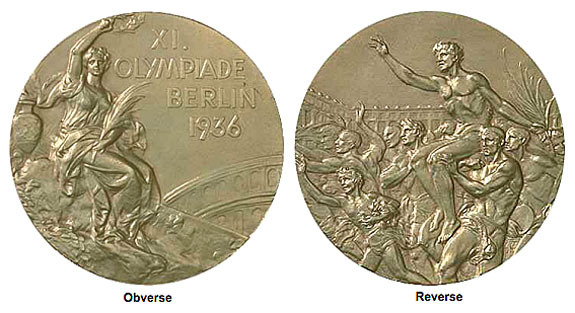 The custom of awarding gold, silver and bronze medals didn't take hold until the 1904 Olympics. Interestingly, the last Olympic gold medal made of pure gold was awarded in 1912. Starting in 1916, the gold medals were made from gilded silver (92.5% silver, plated with six grams of gold). Owens’ 1936 gold medal weighed 71 grams. So, at today’s valuations, the precious metal content would be worth $49 in silver and $272 in gold. Jubilation nearly turned to humiliation for the newest Miss Universe, Gabriela Isler of Venezuela, when she fumbled — but didn’t drop — her red and white bejeweled crown in front of an international TV audience of one billion. All the drama went down in exactly 10 seconds. As the credits rolled during the exciting culmination of the annual pageant, last year's winner, Olivia Culpo of the U.S., placed the coveted crown on Isler's head. 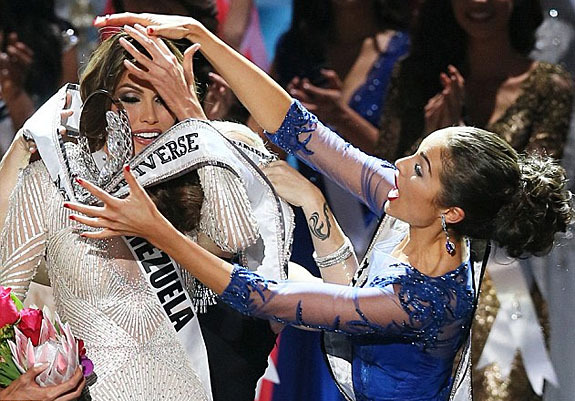 An instant later, an unidentified show official (wearing a black dress and Cleopatra necklace) tried to lower the Miss Universe sash over the 5’10” Isler’s head. But the sash got hung up on the crown, dislodging it and sending it cascading forward. TV viewers around the world held their collective breath as the glittery crown seemed to be doomed. Reacting quickly, Isler and Culpo trapped the falling crown against Isler’s body before any damage was done. Culpo repositioned the crown on Isler's head and the new Miss Universe laughed off the moment as if nothing scary had just happened. Of course, she started her procession with her left hand secured tightly to the crown. If the crown had met a more violent fate, there’s no telling how many of its 1,371 decorative stones would have scattered across the Moscow stage where the dramatic events took place on Saturday night. In the Miss Universe pageant, winners get to keep their crowns, which are designed with 416 carats of diamond simulants and synthetic rubies set in 544 grams (about 1.2 pounds) of white gold and platinum. Diamond Nexus Labs has been crafting the crown since 2009. The 25-year-old Isler is the third Venezuelan in the past six years to have won the Miss Universe pageant. This is an extraordinary accomplishment considering the elite competition. This year, Isler bested 86 contestants from all corners of the globe. “The Orange,” a magnificent 14.82-carat fancy vivid orange diamond, lived up to its pre-auction hype yesterday when it sold for $35.53 million and crushed two world records at Christie’s Magnificent Jewels event in Geneva. 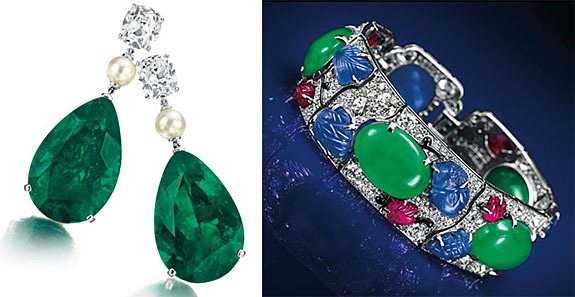 The gem had been estimated to sell in the range of $17 million to $20 million. The last time an orange diamond of this quality hit the auction circuit was 2011 when a 4.19-carat vivid orange diamond fetched $2.96 million at Sotheby’s Hong Kong. 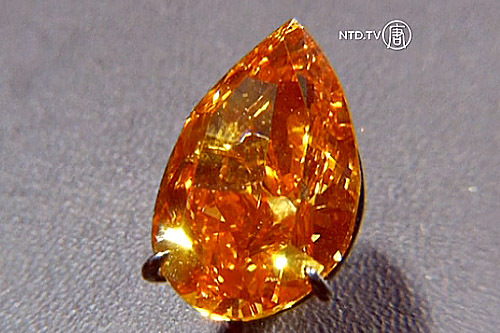 “The Orange” bested that sale price by a factor of 12, and its price per carat of $2.395 million established a new high for any diamond of any color. 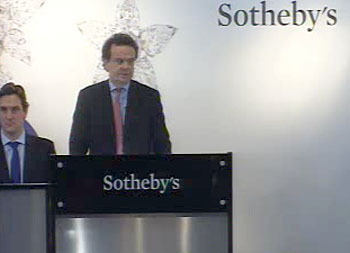 Another record could fall tomorrow at Sotheby’s Geneva when “The Pink Star” hits the auction block. The 59.60-carat flawless vivid pink diamond is estimated to fetch more than $60 million, which would be the highest price ever paid for a gemstone at auction. “The Orange,” an almond size, VS1 clarity, pear-shape stunner, is the largest orange diamond ever graded by the Gemological Institute of America. 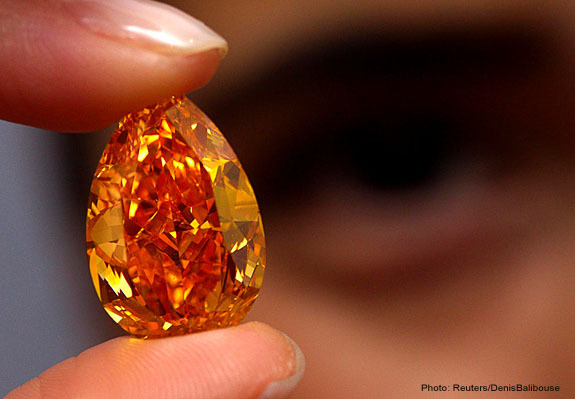 The diamond owes its extremely rare, natural orange color to a faint trace of nitrogen in its chemical composition. 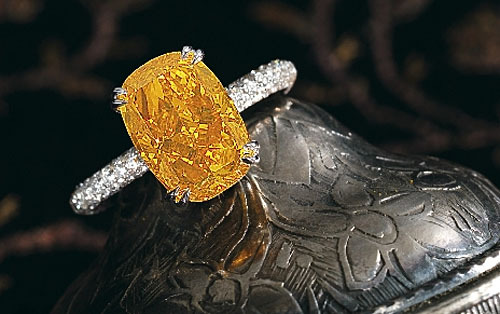 According to Forbes.com, several bidders at the auction venue — the Four Seasons Hotel des Bergues — competed with phone bidders for the privilege of owning the rare orange gem. The bidding started at 10 million francs (about $10.89 million) and quickly escalated to 20 million francs. The record-setting bid of 32.65 million francs was met with applause from many of the 200 gem lovers in attendance. The winning bid was equivalent to $31.6 million, but the official final price was $35.53 million after fees and commissions. The “Pink Star,” an astonishing 59.6-carat internally flawless pink diamond, earned the title of “The Priciest Diamond Ever Auctioned” when the hammer went down with a bid of $83 million last night at Sotheby’s Geneva. The gem, which carried a pre-sale estimate of $60 million, is believed to be the largest fancy vivid pink diamond in the world. The auction of the Pink Star, which could be watched via a live video feed, was a five-minute frenzy of mostly on-site bidding. The opening bid was 54 million francs, which quickly jumped to 60 million and then 65 million. In the end, an unnamed suitor claimed the prize with a bid of 68 million francs. After fees and commissions, the tally came to 76.325 million francs ($83.188 million). The Pink Star’s auction success comes on the heels of similar results for “The Orange,” which set two auction records two nights ago at Christie’s Geneva when it sold for $35.53 million. That 14.82-carat diamond set a new mark for highest price ever paid for a fancy orange diamond and the highest price per carat ($2.395 million) ever paid for any diamond. “Off the scale” in terms of its extraordinary size and richness of color was how Sotheby’s officials described the oval-cut Pink Star during its five-city promotional tour that led up to the sale. Having attained rock-star status in the international press, the Pink Star flattened the previous record of the “Graff Pink,” a 24.78-carat fancy intense pink diamond, which was sold for $45.75 million by the same auction house in 2010. “I have had the privilege of examining some of the greatest gemstones in the world over the past 35 years, and I can say, without hesitation, that the Pink Star diamond is of immense importance,” said David Bennett, chairman of Sotheby’s jewelry division in Europe and the Middle East. The Pink Star was originally cut from a 132.5-carat rough diamond mined by DeBeers in Africa in 1999. Steinmetz Diamonds cut and polished the diamond into its current oval shape during a process that took two years to complete. More than 55 percent of the stone’s mass was sacrificed in an effort to attain the most perfect cut, clarity and color. 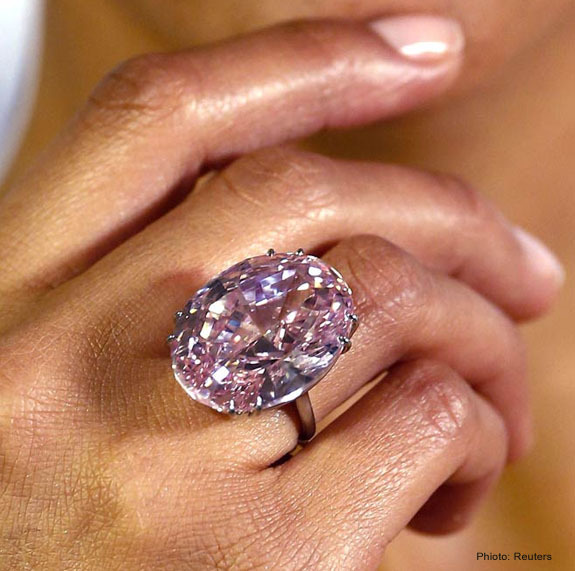 It had been named “The Steinmetz Pink” until it was sold privately in 2007 for an undisclosed amount. The Pink Star, which measures 2.69 by 2.06 cm (1.06 by 0.81 inches), boasts the Gemological Institute of America’s highest color and clarity grades for a pink diamond. It earned a Type IIa designation, which signifies a high level of chemical purity and optical transparency. The diamond is the largest in its class ever graded by the GIA, with the next largest coming in at less than half its size. Another notable piece auctioned last night in Geneva was the “Walska Briolette Diamond” brooch, which sold for 9.68 million francs ($10.57 million). It was estimated to sell for $8 million. Designed by Van Cleef & Arpels in 1971, the brooch is highlighted by a fancy vivid yellow diamond weighing 96.62 carats. The unique briolette diamond was once in the collection of opera singer and jewelry connoisseur Ganna Walska. 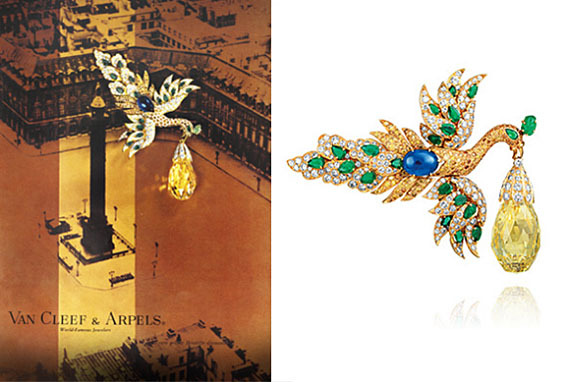 Subsequently, it was mounted as a brooch and exhibited at Van Cleef and Arpels retrospectives internationally. 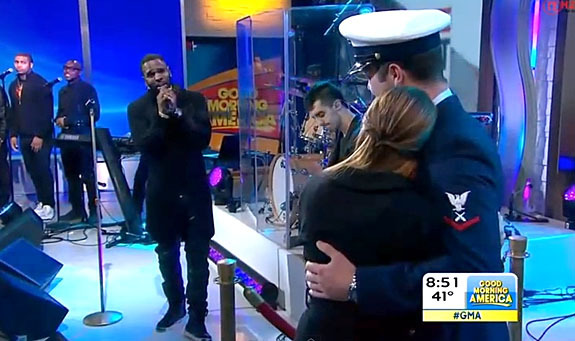 In honor of Veteran’s Day, the crew of “Good Morning America,” recording artist Jason Derulo and the USO joined forces to make a hero coast guardsman's surprise marriage proposal extra special. Fairchild believed that her special access to the live performers was related to her boyfriend’s prestigious award and GMA's salute to service men and women on Veteran's Day. But she was only half right. As Derulo arrived at the first chorus, which includes the emphasized, elongated phrase — "Will… you… marry… me?" — Peikert pulled out a ring box and proposed to his visibly shocked girlfriend. She covered her face with both hands before settling down and accepting the ring and the proposal. After the song, Derulo embraced the happy couple in a three-way hug. Peikert, who is stationed in Opa Locka, Fla., had earned the USO Coast Guardsman of the Year award in October for helping to save a father and son who were swept over a 20-foot dam on the San Marcos River in Texas. 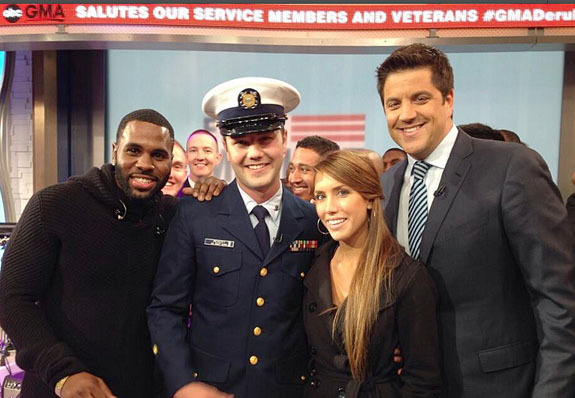 The USO had arranged for Peikert and his girlfriend to get VIP treatment at "Good Morning America" as part of a new campaign called “Every Moment Counts,” which shows gratitude toward service members by creating special moments for them. The 24-year-old Derulo said the love song was inspired by his girlfriend, American Idol winner Jordin Sparks. 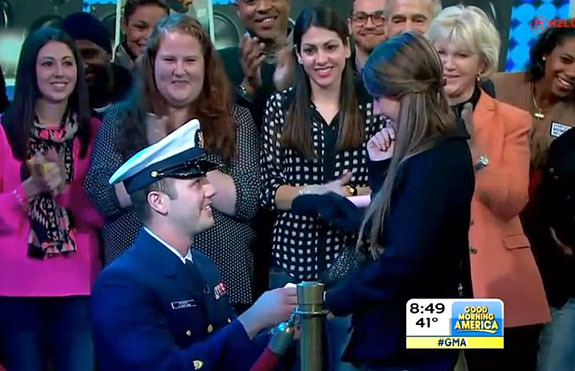 We invite you to enjoy the clip of Derulo’s performance and Peikert’s proposal on GMA. The lyrics to “Marry Me” are below if you’d like to sing along. Written by Jason Derulo, Jonas Jeberg, “Hookman” Marlin Bonds and Andy Marvel. Performed by Jason Derulo. I'll say, "Will you marry me?" How many girls in the world can make me feel like this? Would you marry me, baby? That's precisely what I plan to do, yeah. When a Kansas City Chiefs fan, known only as Rachael, offered to trade her engagement ring and wedding band for four tickets to the highly anticipated Chiefs-Broncos matchup on December 1, season ticket holder Rusty Jones quickly jumped on the deal. "I went to Craigslist and found the ad," Jones told ABC News. "I showed my girlfriend the pictures and asked her if she liked it." Apparently, girlfriend Janie Young-Tesch gave her approval, because Jones and the bridal set owner met on Thursday to have the jewelry appraised and to work out the final details of their trade. By Friday night, Jones had popped the question and now the couple is happily engaged. As the story went viral early last week, Rachael was widely criticized for being desperate and cold-hearted. 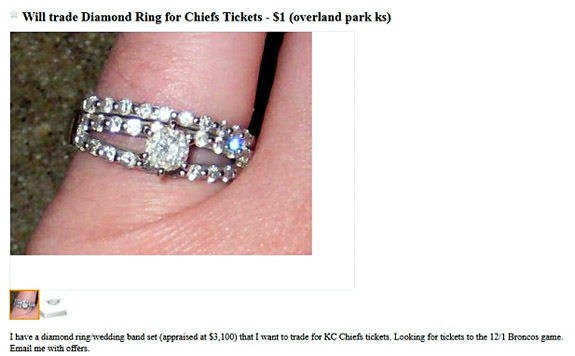 How could she possibly give up her engagement ring and wedding band for football tickets? Later, she deflected the outrage by clarifying that the bridal set was from a previous marriage and that it held absolutely no sentimental value. The coveted Chiefs tickets would be a belated 40th birthday present for her current husband. Rachael had described her bridal jewelry in the Craigslist ad as a “nice diamond ring and wedding band" worth $3,100. The engagement ring contained a .45-carat round, brilliant-cut center diamond in a white gold setting accented with 20 smaller diamonds weighing .50 carats. The matching wedding band contained 10 round, full-cut diamonds with a total weight of .25 carats. Although a Kansas City jeweler appraised the set at $2,800 ($300 less than what Rachael had advertised), Jones still made the deal because the location of his seats in Section 123 near the end zone wasn’t exactly what Rachael requested. She ideally wanted tickets in the Lower Level or Club Level. Jones sweetened the offering by adding two seats to the Chargers-Chiefs game of November 24. The Chiefs and division rival Broncos are having outstanding seasons. The teams played last night in Denver and will meet again in two weeks in Kansas City, where Rachael's husband and his guests will be cheering in Section 123. The Broncos prevailed 27-17 in Sunday’s primetime contest and are currently tied with the Chiefs at 9-1 for the top position in the AFC West. 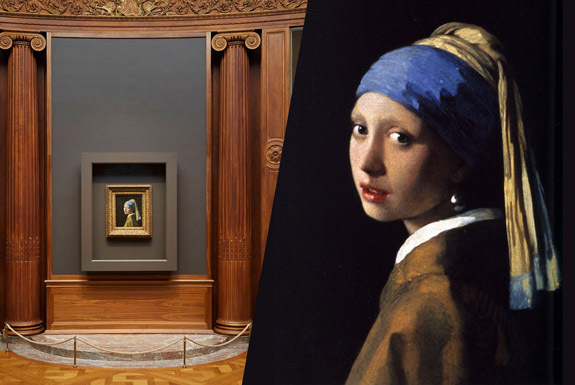 Elevated to superstar status by a best-selling 1999 novel and a 2003 film starring Scarlett Johansson and Colin Firth, Johannes Vermeer’s 17th century masterpiece “Girl With a Pearl Earring” is drawing unprecedented crowds at The Frick in New York City. 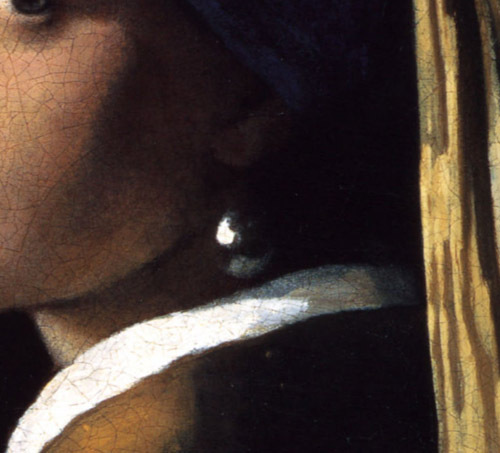 Originally titled “Girl With the Turban,” the painting’s name was changed in the later part of the 20th century because a single drop pearl earring enlivens the portrait of a wide-eyed, moonfaced “Vermeer girl” looking over her shoulder. 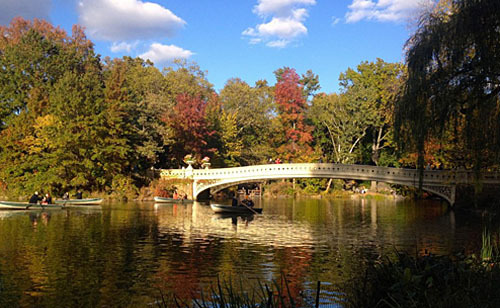 The painting was meticulously restored in 1994 to brighten the pearl to its original splendor, according to NY1.com. "If you look closely, you'll see in the upper part of the pearl, a kind of highlight,” Collection Director Ian Wardropper told NY1.com. “And then you look in the bottom of the pearl and you see a reflection of her white collar. 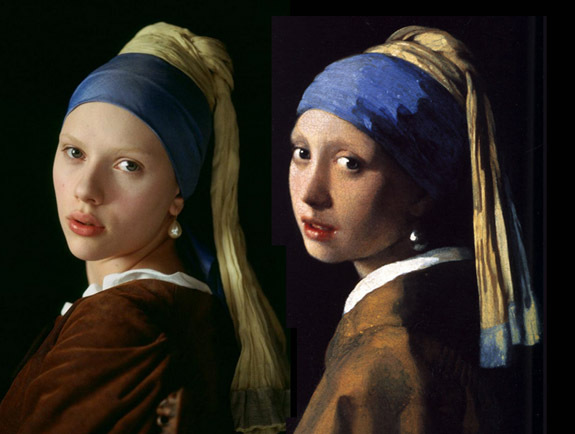 It's just a few strokes of paint, and in that [Vermeer] somehow captures this sense of a glistening pearl." Painted circa 1665, “The Girl” is so special that it is the only work housed in The Frick’s famous Oval Room. This is the first time in nearly 30 years that this painting has been shown in New York. It’s been the crown jewel of the Royal Picture Gallery Mauritshuis in the Netherlands for decades, but the painting has been on a world tour while the museum is closed for renovation. The paintings can be viewed at The Frick through January 19, 2014. The Frick at 1 East 70th St. in Manhattan offers timed ticketing, plus three free Fridays each month. Tickets cost $20 for adults, $15 for seniors and $10 for students. Just when we thought we've seen it all, this cringe-inducing morsel appeared in the pages of Allure magazine. In a piece about unusual fashion and beauty trends from around the world, we learned that hipsters in Amsterdam are embracing eyeball jewelry — tiny platinum charms that are surgically implanted into the whites of their eyes. 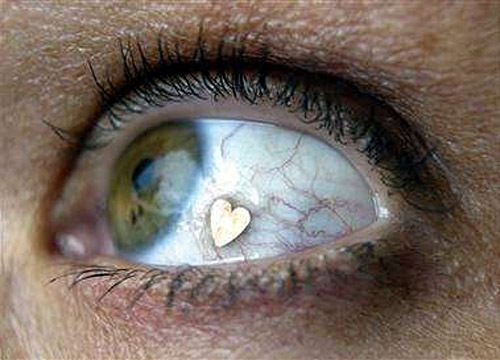 Apparently, eyeball jewelry, also known as extraocular implants, leaves conventional tattooing and body piercing in the dust. It's the latest, most extreme new dimension in the art of body modification. It also looks pretty cool. In a 15-minute procedure that takes place under a local anesthetic, a licensed ophthalmologist makes an incision with a small scissor in the interpalpebral conjuctiva – the eye's transparent outer membrane. 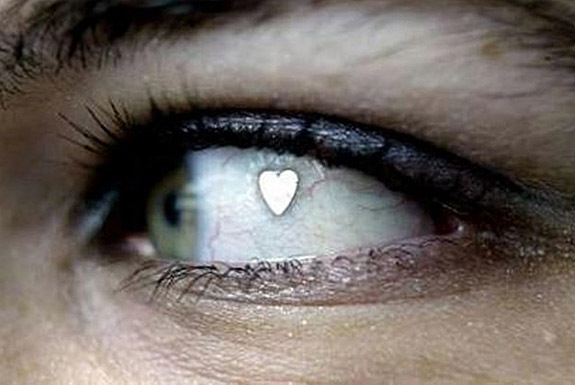 Then, a wafer-thin platinum charm is slipped through the incision into the white part of the eye. Charms are available in a number of shapes, including a heart, star, half moon, four-leaf clover, Euro sign or musical note. Manufactured by Hippocratech in Rotterdam, Netherlands, the jewelry is gently curved to fit the eye and is approximately 3.5mm (0.14 inches) wide. The jewelry may be positioned anywhere in the white of the eye. Branded as JewelEye, these purely cosmetic implants were first developed at the Netherlands Institute for Innovative Ocular Surgery (NIIOS) in 2002 using a technique that had been intended as a means for controlled drug delivery in glaucoma patients. The NIIOS claims that the jewelry implant is completely safe. It does not impair eyesight, peripheral vision or the ability to move one’s eyes. Critics of the procedure have warned that something as simple as eye rubbing could impale the implant into the eye, creating a surgical emergency with a likely loss of vision. Other concerns include the possibility of inflammation, scarring, bleeding or the charm’s migration into the orbit behind the eye, making it virtually non-retrievable. JewelEye procedures start at $1,100 and are currently available only in the Netherlands. 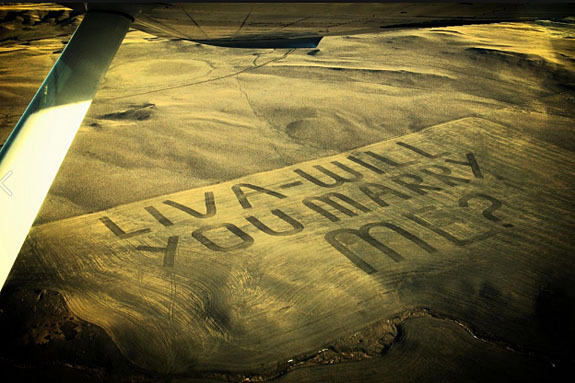 Montanan Miles Steinbach pulled off a monumental marriage proposal last week when he plowed the massive words “Liva – Will You Marry Me?” in his family’s cornfield and then convinced his girlfriend — who is afraid of flying — to view his handiwork from a prop plane. Twenty-year-old Olivia “Liva” Campbell nearly missed what she called her “out of a movie” proposal because of a tight work schedule and persistent “aerophobia,” but in the end all the pieces came together perfectly in Big Sky Country. Steinbach had told Campbell that he needed to take aerial photos of the ranch and asked that she come along to assist. After some prodding, she reluctantly agreed to take the short flight in their friend's prop plane. As the airborne couple neared their destination, Campbell noticed an odd discoloration in one of the fields. With the help of his uncle and a GPS device, Steinbach, a 23-year-old rancher, neatly carved the giant lettering into a cornfield near Bowman's Corner west of Great Falls. 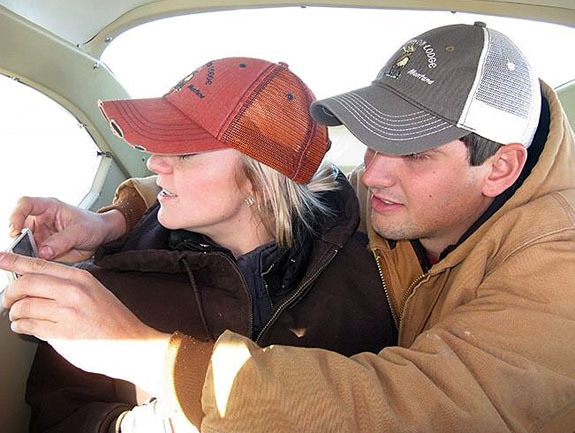 The field was ready for the romantic fly-over about a month ago, but the fickle Montana weather, Campbell’s work schedule and her fear of flying kept delaying the opportunity to get in the air. 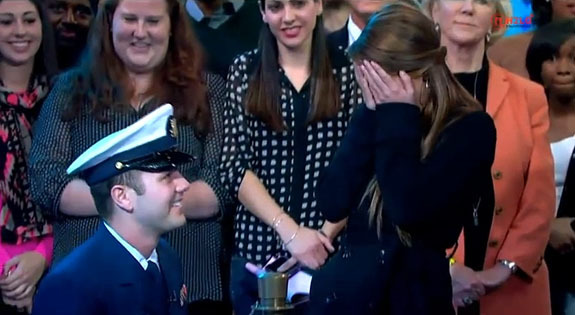 Campbell told GoodMorningAmerica.com that she is still shaking from the excitement of her "out of a movie" marriage proposal. 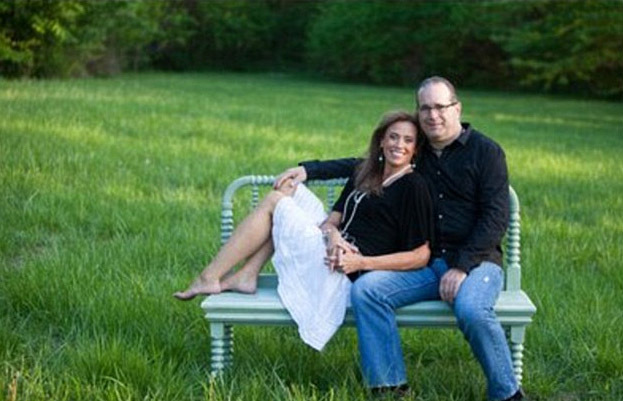 Campbell and Steinbach have been together for four years and plan to get married in 2015, the same year as Campbell’s college graduation. Released in 1989 as the fourth single from U2’s Rattle and Hum album, “All I Want Is You” peaked at #83 on the Billboard Hot 100 chart. Despite its modest success, the song was back on the charts in 1994 when it was re-released after being featured on the soundtrack of the film, Reality Bites. This time, it climbed to #38 on the Top 40 Mainstream chart. “All I Want Is You” has become a popular wedding tune. In fact, Bono toasted newlyweds Luciano Pavarotti and Nicoletta Mantovani with this song during their wedding celebration in 2003. 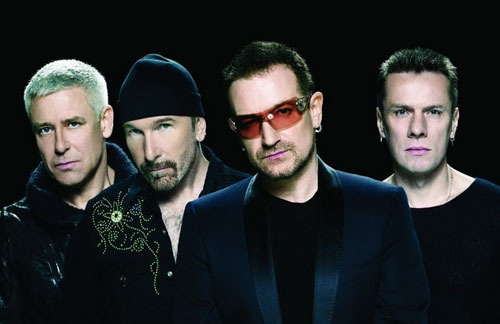 Dedicated to human rights and philanthropic causes, the Dublin-based U2 features Bono, The Edge, Adam Clayton and Larry Mullen, Jr. The group has won more Grammy awards than any other band (22) and has sold more than 150 million albums worldwide. Please see the video of U2’s live performance of “All I Want Is You.” The lyrics are below if you’d like to sing along. Written Bono. Music by U2. Performed by U2. A 52.58-carat D-flawless stunner sourced from the legendary Golconda diamond mines in south central India is the headliner of Christie’s Magnificent Jewels auction set for December 10 in New York City. Christie’s described the octagonal-cut diamond as having “superior luminance, luster and distinct brilliance.” It is expected to fetch between $9.5 million to $12.5 million. Back in April, the extraordinary “Princie” — also sourced from the Golconda mine — rocked the auction world when it sold for $39.3 million at Christie’s New York. 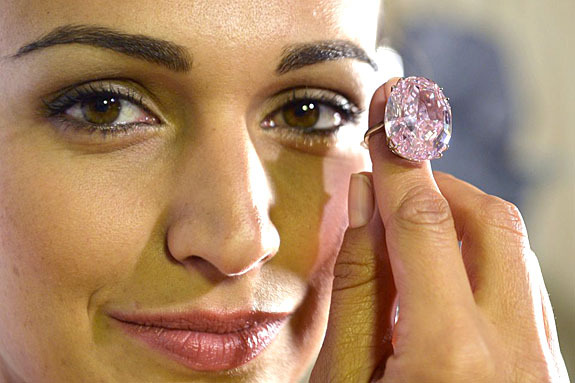 The 34.65-carat cushion-cut fancy intense pink diamond was the most valuable diamond ever sold by this auction house. 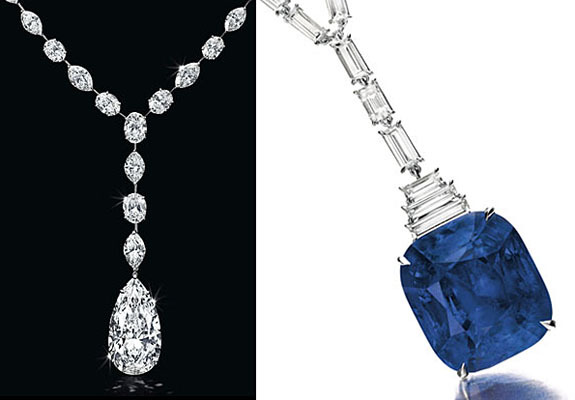 For centuries, India's most prized diamonds have been known as the "diamonds of Golconda," and some of the most famous stones unearthed at the ancient Golconda mines have included the 45.52-carat deep blue Hope Diamond and the 105.60-carat Koh-i-Noor. • A platinum necklace featuring a 22.12-carat D color, VVS1, pear-shaped diamond. The necklace by Leviev is accented with alternating marquise-cut and oval-cut diamonds weighing a total of 38.76 carats. It has a pre-sale high estimate of $3.5 million. • An 18-karat white gold necklace highlighted by a 91.38-carat cushion-cut Burmese sapphire and unique horizontally set baguette-cut diamonds. It is expected to fetch up to $1.2 million. • Unusual platinum ear pendants boast impressive 18.98-carat and 16.75-carat Colombian emeralds, pearls and old-mine cushion-cut diamonds. The pair has a pre-sale high estimate of $850,000. • Colorful multi-gemstone “Tutti Frutti” bracelet was made by Cartier circa 1930. The platinum Art Deco piece features oval-shaped jade cabochons, carved ruby and sapphire leaves, black onyx vine detail and old European-cut diamonds. It is expected to sell for up to $500,000. Overall, Christie’s December 10 event, which concludes the winter auction season, will include 500 lots and is expected to garner more than $45 million in total sales. People struggling with advanced arthritis are often prescribed splint therapy to hold their painful joints in place, but the bottom line is that splints can’t provide pain relief if they are not worn. SIRIS splints elegantly counter all of these objections. The stylish marriage of form and function, the sleek, lightweight, easily adjusted precious-metal splints were invented by occupational therapist Cynthia Garris when she was diagnosed with rheumatoid arthritis and was facing long-term splint therapy. Unwilling to settle for the options being prescribed at the time, she set out to design a new series of splints that patients would be proud to wear. The result was a beautiful line of sterling silver ring splints that therapists may order to provide relief for a wide variety of hand ailments, such as hyperextension, lateral instability, flexion, MCP deviations, thumb problems and triggering. The devices are generally priced from $85 to $395, but may be custom-ordered in 14-karat gold and embellished with a variety of precious gemstones. The company’s web site is at www.silverringsplint.com. Welcome to Music Friday when we bring you super songs with jewelry, gemstones or precious metals in the lyrics or title. Today we feature British alternative rock band Coldplay performing “The Goldrush,” a nifty little song that is teeming with references to gold mining, precious metals and a ring. Reminiscent of the famously spontaneous Beatles studio sessions, “The Goldrush” features Coldplay drummer Will Champion taking over lead vocals as his band mates can be heard chatting in the background before joining in the song. Champion sings, “I went digging for gold, down to the valley, over by the mountain, where the prospector had been told." 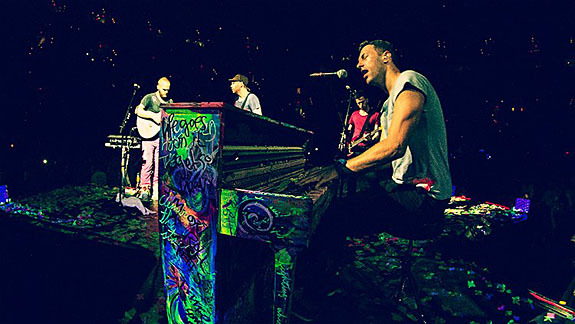 “The Goldrush” had been written for Coldplay’s fourth studio album, but didn’t make the cut because is was so unlike the other songs in the album. Then the band’s frontman, Chris Martin, floated the idea that “The Goldrush” could be offered exclusively to concert ticket holders. In this way, their most devoted fans would be the only ones to know the song. That idea never came to fruition. Instead, “The Goldrush” ended up on the B-side of the Grammy-nominated “Life in Technicolor ii” single, which was released in 2009. Formed by Martin in 1996 under the name Pectoralz, the band would change its name to Coldplay in 1998. Since its inception, the band has sold more than 60 million records worldwide and has earned numerous awards, including seven Grammy Awards. We welcome you to sing along as you listen to the fun studio session of Coldplay performing “The Goldrush.” Click on the YouTube box as the end of this post. Written and performed by Coldplay. Saying what use is the metal if the metal don't shine?